The following individuals and organisations supported Project Endeavour and Jon Sanders' triple circumnavigation of the world. D H (Nobby) Clark was a British Squadron Leader and the adjudicator for Sanders' voyage on behalf of the Guinness Book of Records. Sir Charles Court, AK, KCMG, OBE was the 21st Premier of WA, serving from 8 April 1974 to 25 January 1982. He was the honorary timekeeper for Sanders' triple circumnavigation of the world. His relationship with Sanders began due to his role as Premier at the time Sanders began his double circumnavigation on the Perie Banou. Sir Charles provided a foreword to Sanders' book about the Perie Banou voyage, Lone Sailor. Dr Kim Klaka led the team of Curtin University naval architects and engineers responsible for design work on the Parry Endeavour which included strengthening the hull and building a new keel and shortened mast. Dr Tim Pauly was a WAIT masters student from Centre for Marine Science and Technology (CMST) at the time of Sanders' voyage. He was responsible for the design, installation and testing of the electrical and electronic systems and daily monitoring of Jon Sanders' progress through a remote ARGOS position system. With Jack Seabrook, Dr Pauly participated in regular scheduled radio sessions with Jon from the Royal Perth Yacht Club. He analysed and reported on the Altimeter data and sea mount detection work conducted by Jon Sanders. Sir Charles Court at the official launch of Project Endeavour, December 1985. John Dawkins, Kevin Parry and Don Watts, 25 May 1986. CUL00039/12/90. Emeritus Professor John Penrose was the Director of the CMST at the time of Sanders' voyage. He was in charge of the scientific package carried on the Parry Endeavour and part of the Project Endeavour Management Committee, with responsibility for overseeing the vessel refit and budgeting. He was in regular contact with Jon throughout the voyage and monitored the progress of the Parry Endeavour using the Argos satellite position global network. Des Piesse is a WA boatbuilder and yachtsman and was responsible for the considerable modifications to the Parry Endeavour. In particular, he was involved in the strengthening of the bow and reinforcing the internals of the vessel. Colin Sanders is Jon's brother and at the time of the triple circumnavigation held the position of Director of the National Parks Authority for WA. He owned a third of the Perie Banou. Hugh Schmitt was a WA journalist who covered both of Jon Sanders' voyages on the Perie Banou and the Parry Endeavour. He wrote regularly for the West Australian and the Daily News Schmitt collaborated with Jon Sanders to write Lone Sailor, a book about Sanders' double-circumnavigation of the world and subsequently wrote Sextant, Sea and Solitude, an account of Sanders' triple-circumnavigation of the world. 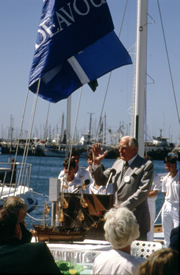 Chris Sherlock worked with Rolly Tasker Sails at the time of Sanders' voyage. He built the mainsail, headsail, storm jib and lightweight number one jib without the aid of computers. Rolly Tasker, AM is a WA sailmaker and yachtsman responsible for shortening and strengthening the rigging on the Parry Endeavour. 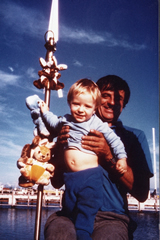 He won Australia's first sailing medal at the 1956 Olympic Games in Melbourne. Rolly Tasker's biography Sailing to the Moon by Roland Perry was published in 2008. John Penrose, 1986 - 1988. The Australian Bicentennial Authority was established to plan and coordinate a nationwide program of celebrations in 1988 to commemorate the 200th anniversary of European settlement in Australia. 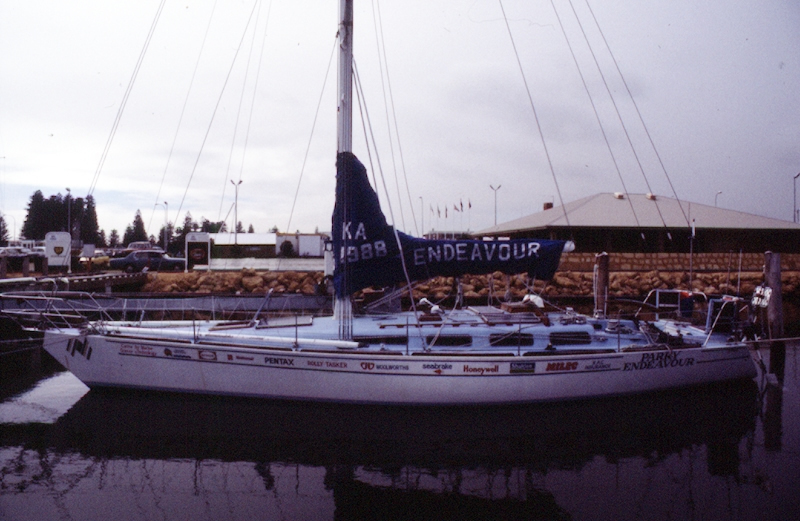 A month before his triple circumnavigation, Jon Sanders sailed the Parry Endeavour to Sydney to seek sponsorship. 21 The Authority endorsed his journey as an Australian Bicentennial Activity. Centre for Marine Science and Technology (CMST) managed the preparation program for Jon Sanders' triple circumnavigation of the world, including a refit of the yacht and design of scientific equipment. Founded in 1985, the Centre was part of WAIT, now Curtin University and its areas of expertise include marine acoustics, hydrodynamics and underwater technology. 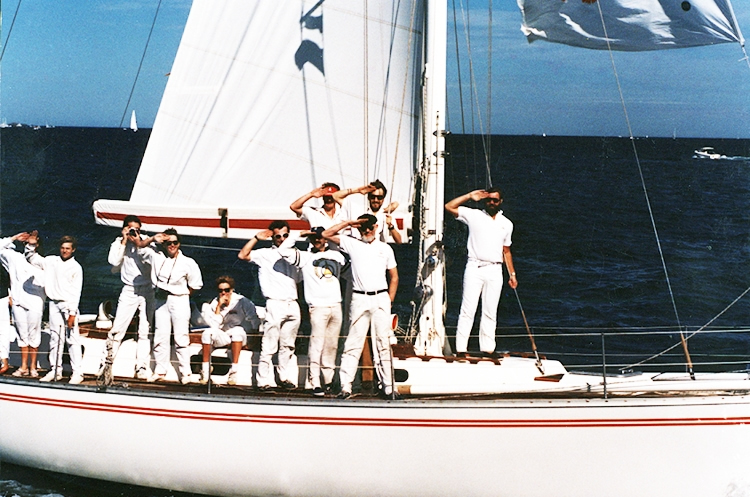 Parry Corporation sponsored Jon Sanders' triple-circumnavigation of the world. The following companies supported Jon Sanders' voyage by provided equipment and materials. Their company logos are painted on the side of the Parry Endeavour.